Mummies discovered in a Hungarian church crypt have helped scientists uncover multiple tuberculosis strains that ravaged Europe in the 18th century, suggesting that, unlike now, a person could have more than one strain. The 265 bodies were discovered in 1994 in a secret crypt in the Dominican church of the town of Vác in central Hungary. On Tuesday, a combined research team from Warwick University, Warwick Medical School and Budapest History Museum, published theirstudyon some of the bodies in the scientific journal Nature Communications. By tracing the lineage and spread patterns of tuberculosis they hope to help fight the disease in modern times. And they did discover a direct link – all of the samples from the 200-year-old secret Hungarian crypt shared the genetic signature of the modern Euro-American tuberculosis strain – which, according to the World Health Organization, still causes about 1 million cases every year. Moreover, most of the corpses showed signs of more than one strain of TB – whereas modern patients only suffer one strain each. The research yielded a total of 14 tuberculosis genomes. "Five of the eight bodies in our study yielded more than one type of tuberculosis – remarkably from one individual we obtained evidence of three distinct strains,” lead author Prof. Mark Pallen, from Warwick Medical School, said in a statement. Using the gene sequences found in the bodies, the researchers traced their diseases back to a common ancestor found in the late Roman period. This reinforces a predominant current theory, which says that TB is only 6,000 years old. Other researchers had suggested it was discovered in humanity's ancestors hundreds of thousands of years ago. Another valuable discovery was the pattern of TB's spread across the 18th-century town, which revealed that whole families were ravaged by the gruesome disease. “We found evidence of an intimate link between strains from in a middle-aged mother and her grown-up daughter, suggesting both family members died from this devastating infection,” said another of the study’s authors, Gemma Kay. The bodies were first discovered during a routine reconstruction of the church. A worker stumbled upon them after he tapped a brick wall and heard it was hollow. He removed one of the bricks and found stacks of coffins. The bodies had mummified naturally, due to an extremely dry environment. It's been suggested the process was aided by pine chips on the bottoms of the coffins, which absorbed moisture and bodily fluids. Pine resin might also have helped ward off parasites and microbes. Many of the bodies had been wealthy Catholics, their stories and details of their deaths described in local records – which helped in the researchers' work immensely. The discovery wasn't just a treasure trove for epidemiologists, either. 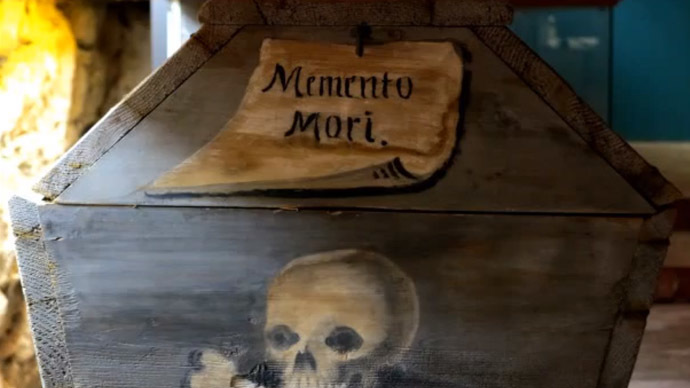 The coffins themselves are an example of fine craftsmanship, each one hand-painted and decorated in a unique way, and inscribed in Hungarian, German or Latin. Articles of clothing and other items the individuals were buried with were maintained in excellent condition, presenting ample material for study. Some of the discoveries, including the mummies themselves, are now on display in the Memento Mori museum, close to the church where they were found.